Updates, mostly about t-shirts, and another LOAA t-shirt giveaway!!! Endless “THANK YOU”’s to all of you who have supported our personal expenses for the journey by purchasing a t-shirt, or just sending us electronic dollars (who deals in the real ones anymore anyway!)! We had more shirts printed over the past week or so, I picked them up just this morning, and we have already sold out of Medium and Large again! I think a much larger order will be called for next time! We will place our next order today, so those of you who don’t have your shirts yet, no fear, we’ll keep having them printed as long as there is demand for them! And again, we are so thankful for our local t-shirt printers, Hayes and Taylor, for working with us on our spastic orders! Check out their website for some cool vintage-inspired designs on super-soft shirts. We honestly weren’t sure the shirts would sell well at all, and I remember thinking we were taking a big risk ordering the first 50 last August. Here we are ordering the latest 50 (after some additional small catch-up orders), and wondering if we can even keep pace with the rate that sales are going lately! And we might have reason to believe that even more people might want one of these shirts soon…yes, that is a teaser, but you’ll just have to wait and see! :) If you’re planning on trying to make it out to see Brandi and gang on tour this summer, grab your LOAA shirt and make it easier for them to spot you in the crowd! For those of you that have your shirts already…you may have seen a call for photos of you in your shirts at some cool location, possibly something that represents your geographic location, or includes an adorable animal wearing an LOAA shirt. If you haven’t already, please send your photos to holly@againtoday.com, and we’ll put together some cool slide show of sorts once they’re all combined! We’ll also post them on our “LOAA Shirts Out and About” photo album on Facebook – get out there and see who’s already shared their pic, and get inspired! 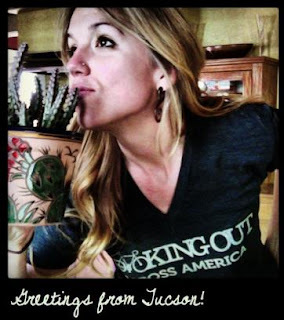 Here's an example: Jessica from Tucson in her LOAA shirt! If you live in one of those states, use the entry form below, and you might just be the lucky winner of your very own LOAA t-shirt, in whatever size you choose! You can enter now through Saturday, March 2nd at midnight, at which point we will randomly select and notify a winner. Good luck! Looking Out Across America T-Shirt Giveaway! Our best friend, Emily, is running a contest for a Looking Out Across America t-shirt over on her blog, www.emilysadventures.com. Head on over there and enter to win! The contest will run through Saturday, February 16th at 11pm EST. Many thanks to Emily for giving up her blog space to us today! "I Could Be the Engine, You Could Be the Wheel"
Erica and I have been getting a lot of attention about Looking Out Across America lately, but we would be mistaken to not introduce you all to our wonderful co-stars of this adventure: our bikes. We will both be riding bikes made by Surly, a bicycle company based in Bloomington, Minnesota. The model we both will be riding is the Surly Long Haul Trucker, designed especially for touring bicyclists. This is the toughest bike around, built to carry all of the gear needed for long trips. The geometry of the frame also allows you to sit more upright than traditional road bikes, which is essential for maintaining a posture comfortable enough to spend long hours in the saddle. Of course, thanks to the kindness of some of our wonderful friends and supporters, our bikes will be loaded down with plenty of gear to aid us in this adventure. We have already outfitted our bikes with a few items, such as bike computers that will help us keep track of our speed, cadence, and distance. And after months of consideration, we ended up naming our bikes, since they will be our noble steeds for this journey. Erica's racing blue bike has been named Kerouac (after Jack Kerouac, author of the appropriately named "On the Road"), and my speedy black bike has been named Padfoot (a nickname for Sirius Black, a character in the Harry Potter series). Here we are with Padfoot and Kerouac; hopefully they are ready for the big adventure they were made for!